« Mirror, Mirror, on the Wall, Which Nations Maintain the Rule of Law Best of All? In recent weeks, I’ve pontificated on Obama’s spendthrift budget, Congressman Dave Camp’s timid tax reform plan, and the corrupt cronyism of Washington. I got to elaborate on all these topics – and more – in this interview with Professor Glenn Reynolds, more widely known as Instapundit. If there was an overall theme, it’s that President Obama’s statist agenda is not helping the country. Other than my hair looking strange, I think this was a good interview. But here’s a point I probably should have included when assessing the President’s performance. If you look at the Census Bureau’s data on median household income (adjusted for inflation), you’ll see that the median American is earning less during the Obama years. And that’s true whether you use 2008 or 2009 as the base year. Now let me provide three caveats on this data, two that help Obama and another that is less favorable. 1. First, if you look at the historical data from the Census Bureau, you’ll see that median household income is a lagging indicator. That means that incomes don’t improve in the first year or two of a recovery. In other words, you can argue, with considerable justification, that Obama inherited bad numbers. 2. 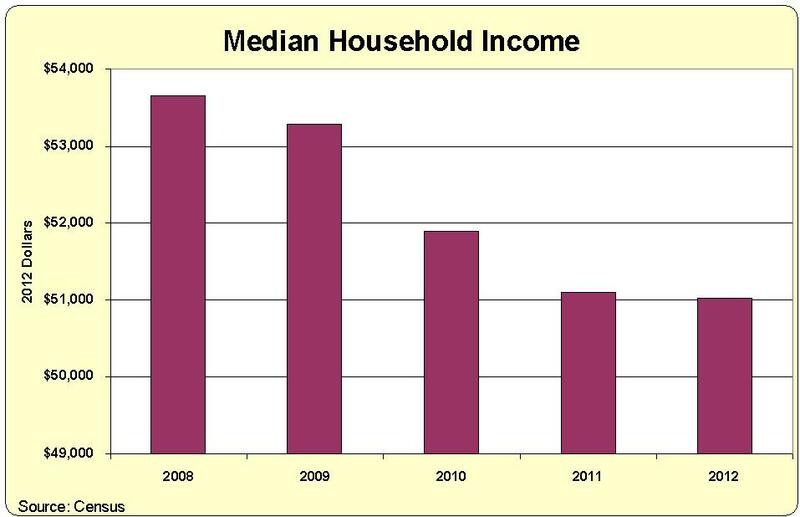 Second, median household income is an incomplete measure of living standards. If you peruse the data, you’ll see that median income for 2012 (the latest available year) is lower than it was the year Reagan left office. I’m a big Reagan fan, so I’m tempted to say the country has lost ground since he left office, but that would be an exaggeration. We obviously have higher living standards today, notwithstanding the Census Bureau numbers. 3. But I’m not making excuses for Obama. My third and final caveat is that the median numbers don’t tell the full story. If you look at the Census Bureau’s numbers for various income groups, you’ll see that the only cohort that has enjoyed higher real income during the Obama years is….drum roll, please…the rich! You read correctly. The bottom 20 percent have suffer lower incomes. The three middle-income quintiles have lost ground. Even the top 20 percent have lower median incomes. The only group that is ahead is the top 5 percent. In other words, Obama may use lots of class-warfare rhetoric to pretend he’s on the side of ordinary people. But his policies (TARP, Solyndra, etc) have been enormously beneficial to the cronyists and insiders that have made the Washington metropolitan area so wealthy. Here’s some of what Senator Portman of Ohio had to say about the topic. It’s been five years since the experts said the recession was over, but for millions of Americans, it feels like it never ended. We’re living through the weakest economic recovery since World War II, and a lot of folks are struggling to make ends meet. Unemployment remains stubbornly high; the number of long-term unemployed is actually at record levels. But these statistics only tell half the story. Eleven million Americans have become so discouraged that they’ve given up looking for work altogether. Poverty rates have gone up, salaries have gone down, with the average family now bringing home $4,000 less than they did just five years ago. Just in case you doubt Portman’s remarks, here’s the chart I produced using data from the Minneapolis Federal Reserve Bank. It shows every recovery since end of World War II. The red line is Obamanomics. Hmmm….this is almost enough to make one think that maybe we should try free markets and small government instead. P.S. 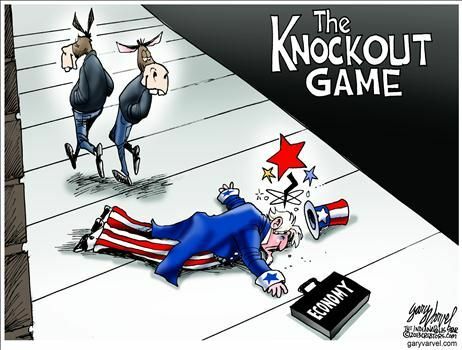 This Gary Varvel cartoon provides a good synopsis of Obama’s economic policy. I also like Varvel’s take on Obamacare, and here’s another one of his cartoons on Obamanomics. Varvel is the best at exposing the spending-cut hoax in DC, as you can see from this sequester cartoon and this deficit reduction cartoon. This cartoon about Bernie Madoff and Social Security, however, is at the top of my list. Great to see 2 of my favorite bloggers interacting! At the risk of sounding pedantic, the paragraph after the one about the hair makes the common mistake of confusing median and average. In the context, it’s obviously a slip, but it might confuse the unwary. While not a big fan of military spending, I can’t believe that Obama’s budget showing cuts to the military was announced immediately after Russia invaded the Ukraine. Talk about tone deaf!! Earned income is no longer the best way to understand what’s going on. If one is talking about inequality, one must include means-tested support, entitlements, and, for those actually earning income, after tax earnings. Under that scenario, the lowest “income” class would be those with no earned income. Once means-tested support is added in, it might well be that this income class has done far better than the next class up, those earning some income; especially since many in this second group are not only paying some taxes, but they are losing means-tested benefits. At the top end, while no one is going to feel sorry for them, earnings increases must be viewed after-tax. Any attempt to revise the tax code must recognize the current reality, that those just starting to make their way up the income ladder are the ones really getting screwed. I still think in 2008 and 2012 it was galloping voter fraud that put us where we are! 47% of the US has realized that if they lower their income they qualify or get more of their taxes back from government. In most states you also have state income and certainly property tax so everyone is paying taxes and often cannot control the spending or “return” on government investment. Our economy grew under Reagan because of the baby boom generation, sheer numbers and with growth there is inflation. What Reagan did do is allow and promote investment in many ways.